Thank you everyone who entered into last weeks Unloved Unused Supply challenge! We enjoyed visiting your blogs and looking at your wonderful cards! This week’s challenge is “White on White With A Pop of Color”. We’re challenging you to make cards for our heroes to send home to their loved ones that are predominantly white with just a pop of color added. Please remember no glitter or glitter products on your cards for Operation Write Home. We’re looking forward to seeing your awesome creations this week! We also have a sponsored challenge this week our kind sponsor is The Angel Company. 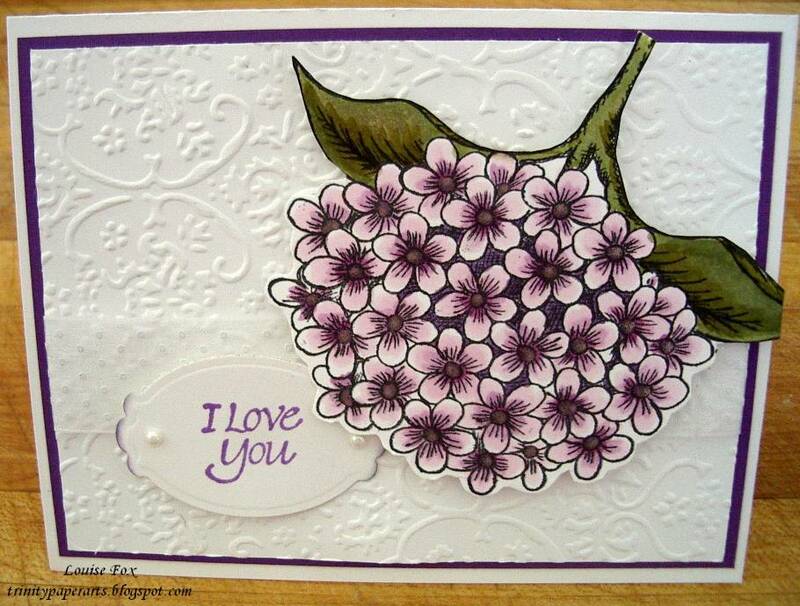 The Angel Company has generously provided the Blossoms & Blessings rubber stamp set pictured below! There will be a drawing January 25, 2011 late in the evening and the prize winner will be announced here the following morning at the beginning of our next Midweek Throwdown challenge! Good luck! Our sample card maker this week is Louise, to see more of her wonderful art work please visit her blog Trinity Paper Arts and leave her some love. Thank you Louise for sharing your awesome talent with us! I just love the sample card. What a fun challenge. What a lovely sample card Louise! I love all the inspiration I find in these gorgeous entries to the challenge! all of these entries are amazing and I had so much fun making a card for this . fabulous - and my unused item was a stamp - gosh I can't remember where or when I got it! Louise your card is just beautiful! Thanks for the inspiration to join this fun challenge! Loving the cards you all did :) Thanks for the white on white challenge!